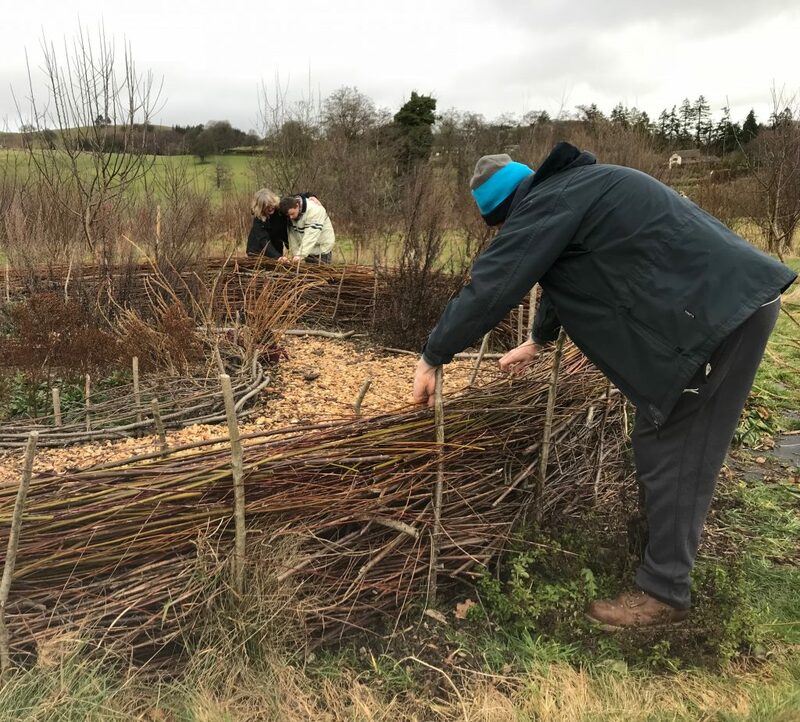 We had a lovely day at Cae Bodfach today as Mencap joined us to fill in the dead hedge that surrounds the herb garden at the orchard using this years colourful willow coppice. It was wonderful to work among the cheerful chirp chirp of the birds going about their business and the back drop hum drum hustle and bustle of the busy little town of Llanfyllin. The colours were so striking and the atmosphere so moving, we all had a lot of fun adding to this easy to do multi-functional structure! 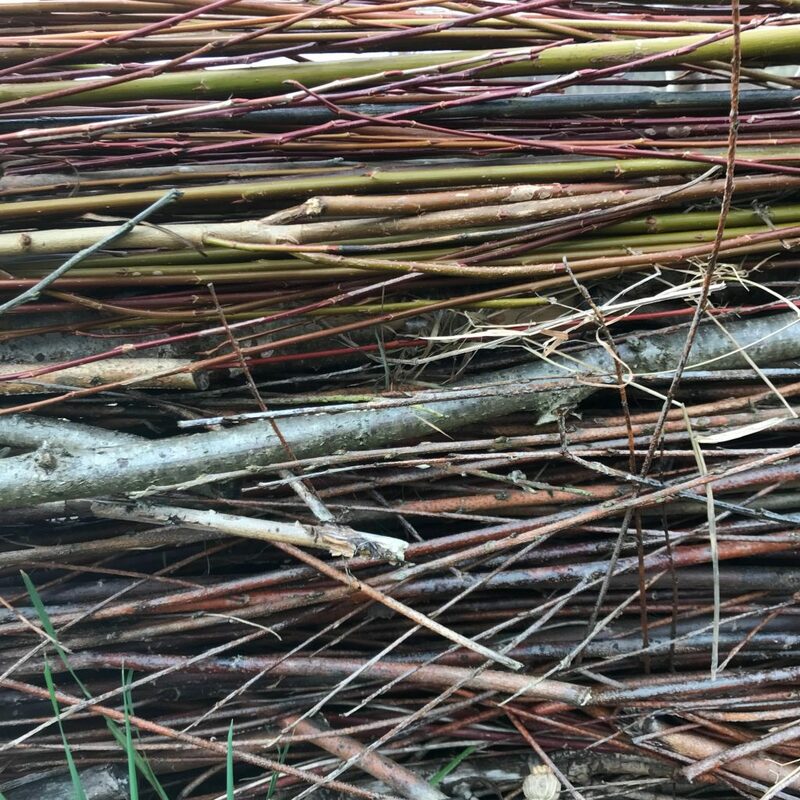 Dead hedges are a clever way to use excess materials found on or near woodlands garden or allotments to create simple, low tech, low cost, ecological structures that have some serious multi-functional purpose power! As you know, in permaculture we say ‘every element must perform at least three functions’ so let me give you at least three functions of the dead hedge! Firstly they can be used as useful structures; as a boundary, to separate or create space, protect a water way such as a pond, to guide people through a space.. we used ours to define the space that is the herb garden. Secondly a dead hedge creates microclimates and provides valuable habitat for a variety of wildlife. From birds to insects, all the way down the food web, past the primary decomposes such as beetles and fungi all the way to specialist microorganisms like Protozoa and beyond. Dead hedges provide shelter, food and homes for entire mini ecosystems! As the dead material slowly rots it releases nutrients and with help from our decomposer and microorganism friends it slowly builds soil helping to increase the fertility and water retention of the surrounding soil. Dead Hedge: A Low Tech Low Cost Ecological solution. Good design links each output in such a way that it becomes an input.